Alpinestars Goretex Motorbike Gloves Size Medium . Condition is Used. Dispatched with Royal Mail 1st Class. Alpinestars SP-1 Motorbike Leather Gloves Red/White/Black. They were bought as a gift for me at the end of last summer, they felt a bit tight on me so I wore them half a dozen times to bed them in before hibernating my bike for winter - just been back on my bike for the 1st time this year and they're still too small for me - hence reason for sale. As you can imagine they're in brilliaht condition. BMW Comfort Motorcycle Gloves. These gloves have been worn but haven't been crashed in. They are marked as size Large - 9 - 9.5. New listingladies Alpinestar motorcycle gloves. Postage Is For UK only. ladies Alpinestar motorcycle gloves. Condition is Used. Dispatched with Royal Mail Signed For® 2nd Class. Had them for a year Change of girlfriend forces sale Ladies Alpinestars SP-3 Leather Bike Gloves New no Tags. Dispatched with Royal Mail 1st Class. Used Lewis Leather Kevlar Ladies Motorcyle /scooter Glove Size S in good Condition. Thinsulate lining. These are a very seasoned pair of Hein Gericke leather Gore-tex gloves. Having a clear out as I no longer have a bike. Fleece Heated Gloves. 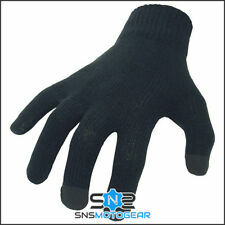 - Keep hands warm in winter with these heated gloves which circulate warmth around the hands and fingers. - 3m Thinsulate fibre featuring a thermal soft lining for added heat retention. 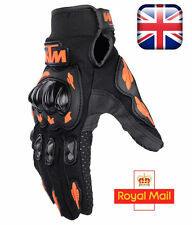 Racer Racing Motorcycle Motorbike Leather Gloves - Black/White Large. When riding a motorcycle, your hands are the most important part of your body. They can control speed, direction and braking as well as the balance in your upper body. As well as this, they are also one of the first parts of your body to hit the ground when in a crash. It is extremely important to keep your hands protected against high impacts. Motorcycle gloves are designed specifically for this purpose. Some of the top brands such as Dainese, Alpinestars, Knox and RST have a variety of different styles of motorcycle gloves available, each with different features depending on what kind of riding they are going to be used for. Racing and sport gloves are designed to give your hands and fingers maximum protection, usually through an exoskeleton, as well as giving them full mobility to manoeuvre during a race. Touring and urban gloves are generally thicker than racing gloves as they are designed for comfort, protection and warmth. Finally, cruiser gloves are like touring gloves, except for the fact that they are designed for the summer months, so they keep your hands cooler. 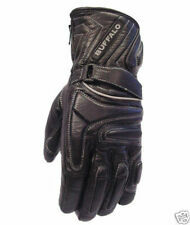 Generally, motorcycle gloves are made from leather. Many gloves have reinforced palms to give an extra layer of protection to your hands upon impact. 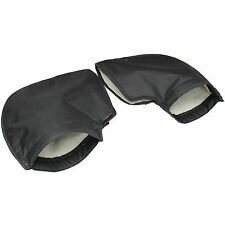 As well as this, gauntlets are often attached to the wrist area of the gloves to protect them from injury as well as to allow cool air inside. 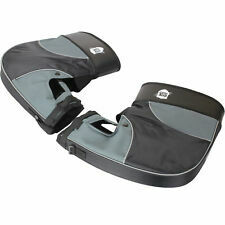 Before purchasing, ensure you know whether you want short gloves or longer ones to protect your lower arm too. An important feature many motorcycle gloves come with is waterproof material. Typically, when buying touring gloves, for example, you should check that they come with breathable, waterproof fabric in addition to insulating materials. There are also heated gloves available for those who like to keep their hands warm during the winter months.